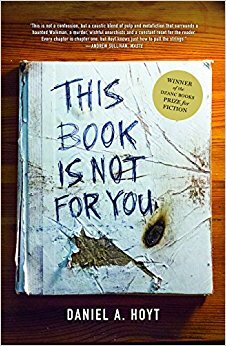 Utilizing an innovative mashup of genres, ranging from pulp fiction, dark comedy, and metafiction, This Book Is Not for You charts the actions of nineteen-year-old Neptune, a misfit and punk haunted by the death of his parents. Having fallen in with an anarchist group determined to blow up a university building, he steals the dynamite instead, igniting an entirely different brand of trouble: the murder of his mentor; a three-way manhunt; and the mystery of the Ghost Machine, a walkman that replays snippets from his own twisted past. Told in a nonstop chain of Chapter Ones, Daniel Hoyt’s debut novel explores the clash between chaos and calm, the instinct for self-destruction and the longing for redemption. ©2017 Daniel A. Hoyt. All rights reserved.